How can content influencers drive B2B marketing success? 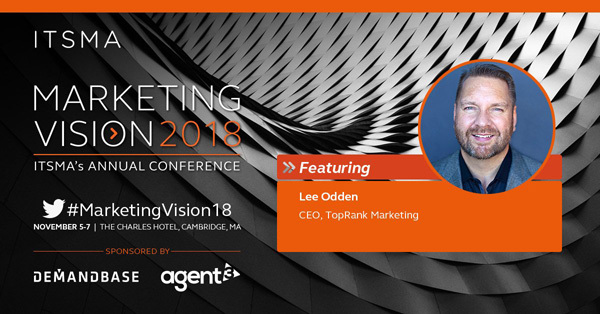 Join TopRank® Marketing chief executive and co-founder Lee Odden as he explores this and how to create scalable, quality content during his Information Technology Services Marketing Association (ITSMA) Marketing Vision 2018 conference keynote presentation on November 7, 2018 from 8:30 – 9:15 a.m. Eastern. What’s the secret formula to scalable, quality content? Registration and complete ITSMA Marketing Vision 2018 conference details are available on the official event website. We hope you’ll join us in Cambridge for Lee’s latest insightful keynote, and be sure to follow along on Twitter using the #MarketingVision hashtag.